Just because you’re capable of re-roofing the house doesn’t mean you should. Approaching digital signage content creation is a similar journey. You know how to figure the square footage of your roof. You know how to buy shingles and have them delivered. You know that you and your brother-in-law can carry the shingle squares up to the roof. And you’re fairly confident that you can lay them out in an almost perfect line. What else is there to it? But will you do it? Hell no. Creating your own digital signage content in-house follows the same decision path. Yes, you are capable of developing the script, acquiring the assets, editing the files together, formatting the files for all the different delivery screens, aspect ratios and file sizes. You can program the messages, schedule the delivery and vary all that by branch and even by zone in the branch. You could do all that, but what else would you get done? And since digital content creation is not your primary job… how would it all really turn out? Probably the same way that DIY roofing job would turn out. Give us a call at Kiosk & Display to handle all your digital signage requirements. It’s all we do. It will turn out well. Oh, and by the way, please call us before you get up on that roof. 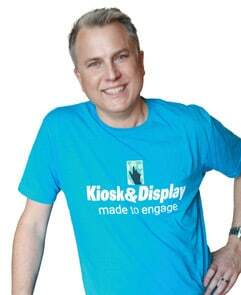 Jon VanderMeer is the owner, Chief Experience Officer and President of Business Development at Kiosk & Display Company. Kiosk & Display is a full-service interactive digital signage agency – made to engage. Thoughtful posts about people, projects & products. All Content © 2017 to Kiosk & Display LLC unless otherwise noted. All Rights Reserved.